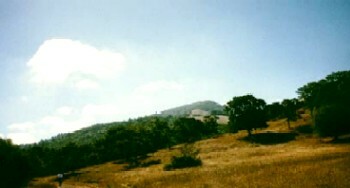 Annadel is a wilderness refuge surrounded by city. Just minutes from downtown Santa Rosa, this 5,000 acre park has 40 miles of trails. The dozens of trails in the park interconnect, offering a maze of choices. 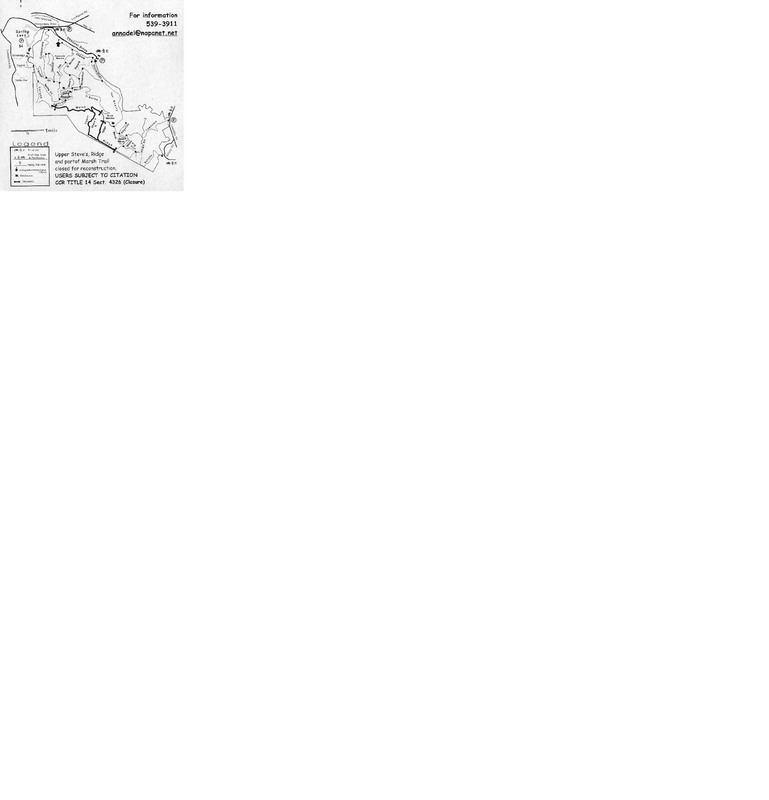 Annadel is popular with mountain bikers of all abilities and there are sections and trials that are fairly advanced. The parks elevation ranges from 360 - 1,880 feet, with some trials climbing steeply. All of the trails are well marked. In the mid '90's a trail management campaign was launched to save the park's fragile habitat, and the makeover is still continuing today. The last completed phase of the makeover took place over the winter of '00-'01. This included the rebuiling of portions of the Marsh and Ridge trails. Also a portion of the Ridge Trail has been closed and replaced by a newly built trial. This new Rigde Trail has absorbed the former Upper Steve's "S" Trail. On my map the trails that were closed for reconstruction are highlighted, but I haven't been able to get my hands on a current map showing the new trails - as soon as I do it will be posted. The current phase of the makeover involves the rebuilding of the Lawndale and Schultz trails. The Lawndale Trail was closed May 1st and the Schultz Trail is schedule to close June 1st. The trails will be reopened next spring or summer. To get there from 101 take 12 east across Farmers Lane onto Hoen Ave. Go right on Summerfield Rd. Take the next left onto Stonehedge Dr and continue until the road turns right. At this corner there is an access gate to the Spring Creek Trail. This is a 4 mile loop that takes up from Spring Creek Trail to Lake Ilsanjo. Elevation change is 700 feet. Follow the short trail from the access gate to Spring Creek and go right (south) on this fire road. At 1/4 miles you'll cross a bridge and then go left onto Rough Go Trail. This rocky trail climbs fairly steeply for 1 mile, passing Cobblestone then Orchard Trail on the the left. Rough Go levels off and at 1 5/8 miles passes Live Oak Trail on the left. At 2 1/8 miles you come to Lake Ilsanjo. Go right on the Spring Creek Trail. From here it's 1 7/8 miles back to the Stonehedge spur. Spring Creek Trail descends steeply down a rocky trail. At the bottom of the hill you cross a small stream and the trail becomes a smooth single track. At the junction with Canyon Trail you continue right onto a fire road which takes you past Rough Go back to the Stonehedge spur. This is a pretty short ride, but exploring the trails that branch off of this loop can double its length. While climbing up Rough Go you can take a left onto Cobblestone. Then go right onto Orchard and follow that back to Rough Go. Shortly after getting onto Orchard you can take the Orchard Trail Loop on the right that loops back around to meet up again with Orchard - I'd recommend this route. It's a smooth twisty single track. Once back to the Rough Go junction go left and follow Rough Go to Live Oak. Go left onto Live Oak. This trail has some fairly technical, rocky, single track. Continue on Live Oak to the N. Burma Trail and go right on this trail. Follow this and then go right on Steve's Trail. Follow this across the Warren Richardson Trail, around Lake Ilsanjo on you right, passing Canyon Trail on your left, over the dam to Spring Creek Trail on the left. You can also go straight at the intersection of Live Oak and N. Burma. This takes you on a good stretch of downhill. You then take Channel and Richardson back to N. Burma. 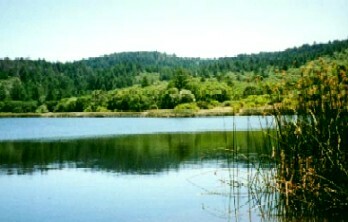 This loop takes you around Ledson Marsh, past Buick Meadow and and then Lake Ilsanjo. Follow the short trail from the access gate to Spring Creek and go right (south) on this fire road. Continue past Rough Go trail on your left at 1/4 mile to the junction with Canyon Trail at 3/4 mile. Veer left over a bridge and onto Canyon Trail. This fire road climbs 1 3/8 miles to the Marsh Trail junction. Take a right onto the Marsh Trail and follow it to the new Ridge Trail. Take this trail off to the right. At the next junction go right. This trail drops you onto Pig Flat Trial, where you'll go left. Follow this to Ledson Marsh, where you go right onto Marsh Trail. Follow this around the marsh to its intersection with the South Burma Trail at Buick Meadow. Go right onto S. Burma and follow this to the Warren P. Richardson trials. Go right and follow Richardson a short distance to N. Burma. Go left on N. Burma and then left on Steve's Trail. Follow this around Lake Ilsanjo and then follow Rough Go all the way back down to Spring Creek. If you're looking for a tough ride take an alternate route by continuing straight on N. Burma past Steve's to Live Oak. Go right and follow Live Oak back to Rough Go. This takes you up a rocky, technical single track. Sonoma County Parks - Annadel State Park Sonic Net, Inc.